The map shows the subway project as it will be further studied in a final environmental impact report. After literally decades of talk, false starts, community resistance and funding dead-ends, a route for an extension of the subway to the job-rich Westside was selected by the Metro Board of Directors on Thursday in a vote called historic by several Directors. The Board of Directors voted 10 to 0 with one abstention (Supervisor Mike Antonovich) to select “alignment two” of the five routes studied over the past year-and-a-half in a draft environmental study of the Westside Subway Extension. 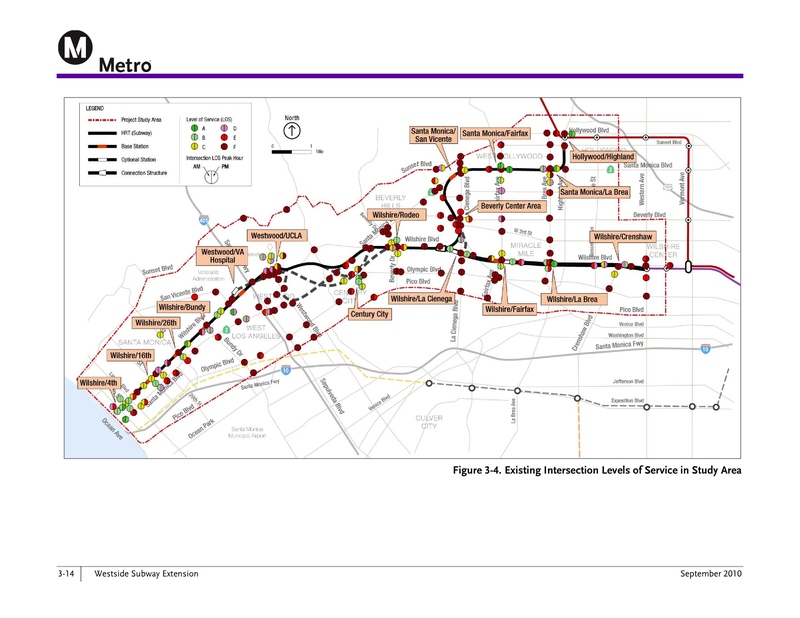 The 9.5-mile route, as shown above, with seven new stations begins at the current Purple Line station at Wilshire Boulevard and Western Avenue and runs mostly on Wilshire Boulevard to a station near the VA Hospital in Westwood, just west of the 405 freeway. It would take about 25 minutes to ride the subway from Union Station to the VA Hospital station. A trip from the North Hollywood Red Line station to the VA Hospital station is estimated to take about 36 minutes plus the necessary transfer at Wilshire/Vermont. Journeys between those locations by bus and often by private vehicle are often twice as long. The area to be served by the subway extension has the second-most jobs in L.A. County outside of downtown Los Angeles. The Westside subway would serve as an alternative to sitting in Westside traffic. This map shows the level of service at intersections on the Westside. Click above for a larger image. The Westside Subway Extension is among a dozen transit projects to be funded in part by Measure R, the half-cent sales tax increase approved by voters in Nov. 2008. Without the $4.2 billion provided by Measure R, the subway extension would not be possible. If additional federal loans and other financing can be obtained — a plan called the 30/10 Initiative to speed the construction of Measure R projects — the entire subway would be built at once and would open to Westwood in 2022. It remains to be seen whether segments could be opened earlier. Three big issues remain to be resolved in the final study: the exact location of the station in Century City and the two stations in Westwood. (Here are the Metro staff recommendations looking at issues along the line). In Century City, the choice of a location has been narrowed down to Santa Monica Boulevard and Avenue of the Stars or Constellation Boulevard and Avenue of the Stars. There is an earthquake fault along Santa Monica Boulevard in that area and Constellation is closer to the center of Century City — but a station there would require tunneling under a few homes in Beverly Hills and Beverly Hills High School. Both city officials from Beverly Hills and officials from the Beverly Hills Unified School District have threatened legal action if that route is selected by Metro, saying that subway tunneling could pose a danger to students and interfere with future plans to expand the high school with dollars from a school bond passed by city voters in 2008. An official from Beverly Hills on Thursday said that even though there may be a slight chance of danger from the subway, it’s better to put that slight chance under a roadway — Santa Monica Boulevard. School district officials told the Board of Directors that the high school is the city’s only high school and served as the city’s emergency preparedness area. The Board also approved a motion by Supervisor Zev Yaroslavsky — who represents the Beverly Hills area — asking for more study of the city’s safety concerns. On Thursday, Yaroslavsky amended the motion to include safety issues in Westwood, where the subway would also tunnel under homes. Other speakers on Thursday spoke in favor of a Constellation station in Century City, saying it made sense to put the station nearer to the center of Century City and the most jobs. In Westwood, the first station will be at Wilshire and Westwood boulevards or slightly west under UCLA Parking Lot 36. Metro staff wants more time to determine future development plans for Westwood and whether those projects would interfere with the tunnel alignments required to reach a station at the UCLA site. Staff also wants to further study locations for the VA Hospital station — specifically whether to put it north or south of Wilshire Boulevard. As part of the draft environmental study, Metro staff also studied a route that would take the subway all the way to downtown Santa Monica and another route that would run from the current Hollywood/Highland station through West Hollwyood and connect with the Wilshire line in Beverly Hills. A station at Crenshaw and Wilshire was also studied as part of the alternative chosen by the Board. The Board also accepted the Metro staff recommendation it be deleted from the project because it was just one-half mile west of the existing station at Wilshire and Western and in a low-density, mostly residential neighborhood. Both the Santa Monica and West Hollywood alignments would likely attract significant numbers of riders, according to Metro staff. The problem was threefold: 1) the Wilshire route performed the best; 2) there wasn’t enough Measure R or other funding available for the Santa Monica and West Hollywood lines, and; 3) neither of those alignments at this time meet the key “cost-effectiveness” threshold required to attract federal funding. Supervisor Mark Ridley-Thomas, in a committee meeting last week, requested that Metro staff report back later this year on what could be done to study a future transit project to serve the West Hollywood area. Metro, with the city and county of Los Angeles, is also in the midst of planning a peak hour bus lane along 9.7 miles of Wilshire on the Westside. The lanes are expected to improve bus speeds and help subway passengers reach their destinations between rail stations. In the early 1990s, Metro had finished the environmental studies and entered into a funding agreement with the federal government to extend the subway from Wilshire and Western to Pico and San Vicente. In the wake of construction problems and cost over-runs on building the subway to Hollywood, county voters in 1998 approved a ballot measure to suspend using local sales tax dollars for subway tunneling, effectively killing the project. The subsequent segment of the subway from Hollywood to North Hollywood was built on time and on budget and opened in June 2000. The Red and Purple lines today average about 150,000 boardings on weekdays. Estimates are that the new line will attract 53,000 boardings just at the new stations but also increase ridership across the existing Metro bus and rail network because of improved transit access to the Westside. Thank you so much. As a long-time UCLA commuter, this makes me incredibly happy. This is great news! Now we need the Century City station to be placed at Constellation and Avenue of the Stars – In the CENTER of Century City. Let’s not give into the baseless NIMBY concerns of Beverly Hills residents. 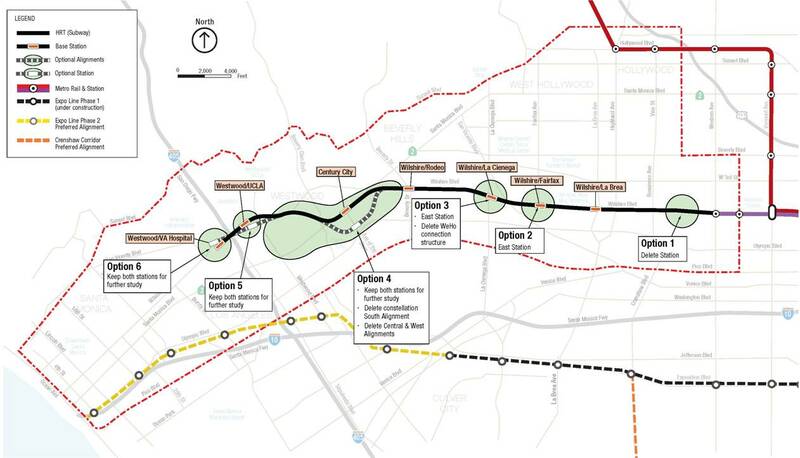 what would make this plan complete is an underground rail from Sylmar to Westwood! Right down Sepulveda Blvd! Oh please! Has any thought or planning taken place regarding integrating a possible 405 line into these plans? The money might be quite scarce, but a subway from Westwood to Van Nuys certainly makes sense from a planning perspective, since it can go much faster through the hills than a light rail could, no climbing the Santa Monica Mountains would be involved. Also, it is likely that a station between UCLA and Sherman Oaks would not be required due to the low density of housing underneath Bel-Air. The Red Line already goes underneath the Hollywood Hills with no stations, and that is the fastest portion of the Red Line. Once the Century City and Westwood station problems are resolved, I am hopeful that the route will soon be extended along Wilshire Boulevard to Santa Monica. Doing so will certainly ease traffic congestion throughout the Westside area and on the 10 freeway. This is a great step in furthering to make LA a great place to live and work. It will put us in line with what other great and wise city have been doing for many years. As a UCLA commuter (vanpool) making a connection from Long Beach (via downtown) woud be awesome. A truly wondrous and momentous day for the Westside and the greater L.A. region! As a Beverly Hills resident who lives in the area concerned, I wish I could have been present at today’s meeting to testify in *favor* of the Constellation route, which would go under within ~500 feet of where I live. I’m fine with it, and think the Constellation station makes much much much more sense for the 50,000workers in super-dense Century City. I further do hope we can find a way to fund an extension of the Purple Line to Santa Monica and to Hollywood some day soon. This is fantastic news! I would use the subway all the time. I live right on Santa Monica and Fairfax. I would be able to leave my car at home and avoid parking tickets. I don’t understand why it will take 9 years to build a single line when Cairo and Athens recently completed multi-line subways in under 7 years. Any subway that does not go to the West of the 405 is just a partial job. Let’s hope this is just “Phase 1” of the project. Another issue would seem to be lack of parking near subway stations. This could make it difficult for many people to access the subway. The Westwood station should also be closer to UCLA. There’s no reason the subway shouldn’t swing up into the village — makes the most sense. Also, the century city station should be on Santa Monica, which offers the best options for transfers to buses. Yes, a subway along the 405 would be a good idea; north/south connections are needed. As the earlier comment noted, why is there no discussion for a light rail line down the middle of the 405 to access LAX? This would create a true grid in terms of LAX access for the entire southland. It would link up with eastbound travel in three different places: the VA hospital, the Expo Line, and the new LAX stop along the Crenshaw Line. 1) Yea! For movement, but why such an emphasis on museum row? Seriously… there’s so much hoopla about LACMA. Maybe they only have 850,000 visitors a year because it’s not “essential.” I’m an artist and I’m saying that. The subway needs to server our NEEDS, not prop up the artistic community and elite funded art installations. 2) BOO! your’re missing such an opportunity to serve L.A. by having BETTER hubs more centrally located? Wilshire? Why not Santa Monica Blvd.? 3) DOUBLE BOO! No WeHo Spur. This smacks of discrimination. Having a spur makes such sense and integrates the area so much better than extra stops on Wilshire. I get there are politics and Century City wants people to shop there and agents and the like want to be able to provide transportation for their workers…. but it makes me almost regret for voiting for R. I wish you could poll who voted for what so you could reward the very people who voted Metro the money. It almost makes me regret it. Heck… the people in Beverly Hills and Wilshire probably vote AGAINST giving Metro the money… yet you’re servicing them. Shame on you for bending so quickly to politics. The community meetings you held in WeHo were a joke and it makes it seem like you did it just for show. Shame on you. Very disappointed in you. Reconsider. I know it is too late now, but wouldn’t it have made more sense to put the CC station half way between SM blvd and Constellation with entrance structures at both intersections? The construction would probably cost more due to mostly subterranean construction and multiple entrances but it would have probably avoided BHHS and likely had even higher origin/destination numbers. Your suggestion was included in DEIR but was rejected due to the extra cost and lack of benefits. The orientation of station under Ave of the Stars also means extra turns of the tunnel/track which is rather impractical. Metro got it right with the Constellation location. Please make this retroactive to 1967. A subway that ends at the VA, and never makes it to santa monica is not going to get drivers out of their cars. It will just replace people riding the bus with people riding the rail. To get people out of their cars, the subway needs to extend all the way to the beach, and give the public a real alternative to get to where all the shopping and tourism is. Its about time, only 85 years. If one remembers the Pacific Electric also planned a westside subway. In the old Subway Tunnel there is a wall pointing west that was the starting point of the Vineyard Subway(Pico and Rimpau). I guess all good things due come in time. It is my first post here, so I would like to say hallo to all of you! It is really diversion to be adjacent to your community! It is great news that this is finally set in stone. This one of the most important new connections for rail in LA which should have been built 20 years ago. However, I agree that it does not do enough (I know funding is not there yet) but there should at least be a clear plan on extending it to downtown Santa Monica. It is very dense and will attract A LOT more riders and is certainly an investment for the future. Until then, there should be a way to connect the expo line directly to the purple line since that at least goes to downtown SM (or will soon). LA is not just a city of commuters, a lot of visitors use the current rail and wish there were more. LA is already hard enough to get around by car for people who are not familiar with the area (Ive seen many people riding rail that say they are surprised and disappointed that there aren’t more lines to more places). Rail transit can and should serve anybody that it is near, including tourists (It is like this in many other cities worldwide). As a Beverly Hills resident who actually does live within 500 feet of the proposed constellation route, I am very concerned about the risk of noise, vibration, and property damage. The arguments in favor of locating the station on Constellation are specious. I just walked CPE today, and the distance between Santa Monica Blvd and Constellation is comparable to that of some of the entrances to tube stations in London. It’s ridiculous that Metro would choose to engage in a potential legal fight with the city and residents of BH over a distance of 1 block. ONE BLOCK! Very excited about the westside subway. An important step in making L.A. a more sustainable and efficient metro area. Im very excited to hear about the subway extension to the Westside. But I really hope this is Phase 1 because the subway needs to be extended to Santa Monica. The 10 Freeway is getting worse year by year and extending the system just to the VA Hospital is not going to make a difference. Not only residents who have their jobs in this area will benefit from the subway but it will bring more tourism to the region, and create jobs. A possible line between the Westside and the San Fernando Valley would be great too. 1. Buses in the dense Santa Monica area will become much more attractive once the VA Hospital station opens, because a short bus ride would be complemented by a long fast train ride – better than the current 1.5 hours to West LA. 2. If funding for a subway is difficult to achieve to get all the way to Santa Monica, the Exhibition Line could be continued east up Wiltshire to join the Purple Line to the most westerly point funding can get it to. 3. Once extended to UCLA, buses from the Orange Line could link to the subway using the new HOV lane through Sepelveda Pass. If Tutor-Saliba is allowed to bid on this project, I hope that they are going to be very closely watched. You should do some more walking before you make a conclusion that the subway would vibrate and rattle Beverly Hills High School and the nearby homes. Go walk around the numerous schools on Secenth Sttreet and Wilshire Boulevard, or at MacArthur Park, and see if the trains are apparent as they whiz by underneath. Take a stroll under the houses, schools and busineses along Hollywood Boulevard or Vermont Avenue. Those schools and apartment buildings sit directly above the Red Line. See if you can discern any noise or vibration. Then talk to the homeowners in the Hollywood Hills, those who live above the Red Line tunnel who predicted noise, avalanches, the drying up of mountain springs, and other calamities. The fact is — you will not hear the subway. The schools are not affected by the trains, not impede at all by the subway deep beneath them. The fact of the matter is that the Beverly Hills people are saying “we are better than you, LA, and we need special treatment.” THere are thousands of people who live directly above the existing tunnels. Thousands of schoolchildren safely attend classes directly above the Red Line, not knowing it is there. The BH opponents will not accept the overwhelming facts that they will not even know the trains Re down there. They are simply seeking validation for their “we are better than you” view of the world. By all means, young man, do some more walking. for those who do not know… the expo Line is already planned to go to downtown Santa Monica in it’s second phase which is why they aren’t going extend it to Santa Monica. I think its a perfect location to stop it at. A lot you all say connect it to the expo… but in actuality it will take ridership from the expoline as people will choose subway over light rail. That’s why it isn’t going to make it to the beach.